A fine and rare pair of 12-bore sidelock ejector over-under guns by London maker James Purdey & Sons will be included in Gavin Gardiner Ltd’s Auction of fine modern & vintage sporting guns & rifles, which will be held at the world famous Gleneagles Hotel in Auchterarder, Perthshire on the evening of Monday, September 2, 2013. Completed in 1964, the pair remain in excellent condition and are in their original case with extra barrels. They are expected to sell for between £55,000 and £65,000 [See Illustration]. The sale will include over 200 lots of fine sporting guns, rifles and shooting accessories – both for the keen sportsman and collector- dating from 1860 to the present day. 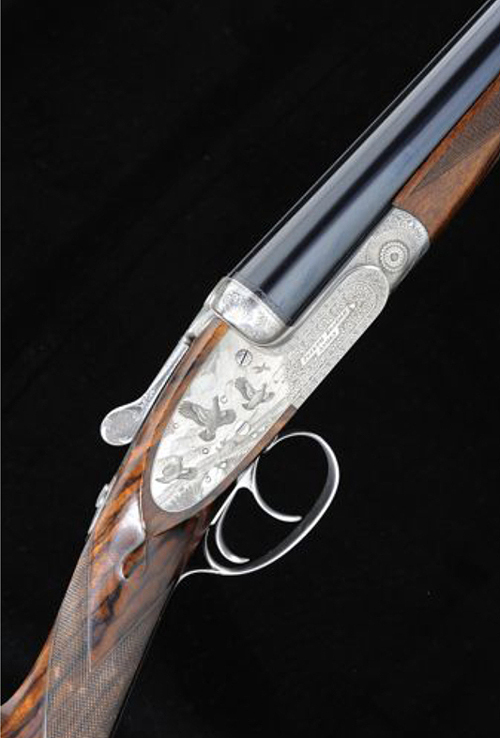 Purdey, Holland & Holland, Boss & Co and Westley Richards are just a few of the famous gunmakers that will be represented at this auction, held at the Gleneagles Hotel. A famous sporting venue in it’s own right, the sale is now in its 46th year and is held during the first three weeks of the grouse shooting season and attracts bidders and buyers from all over the World. Numerous record prices have been set at previous sales and Gavin Gardiner Ltd look forward to repeating that this year. A rare 12-bore sidelock ejector gun by London maker, Joseph Brazier, with engraving by renowned master engraver, Alan Brown, is another highlight. Engraved and finished to the highest standard, it was completed in 1989 and remains in exceptional condition. Alan Brown is one of the most renowned engravers of his generation and his work is sought by collectors the world over. It is estimated at £14,000 to £18,000 [See illustration]. An unusual gold engraved 12-bore sidelock ejector gun by John Wilkes, again a London maker, and a gun that was part of the renowned Tulchan collection is expected to attract International interest (Est: £14,000-18,000). In addition, a rare 20-bore self-opening sidelock ejector gun by Watson Bros, completed in 1990 and retaining much original finish is estimated at £18,000 to £24,000. There are many pairs of guns in the auction, including examples by Purdey and Boss & Co. The renowned Scottish maker John Dickson & Sons is also represented with a fine pair of 12-bore round action ejectors expected to sell for between £12,000 and £15,000. A rare 12-bore “Superbritte” side-opening over-under gun by Belgian maker Mascallier is expected to sell for £12,000-15,000. Only a relatively small number of guns were produced to this unusual design were built and they are now keenly sought by collectors who appreciate their quick and lively handling characteristics, as well as they quickness in reloading for an over-under gun. Of Wildfowling interest will be two rare “Punt Guns”. These large calibre single barrel guns are designed to be used in a Punt, a special low type of boat for use against flocks of geese. 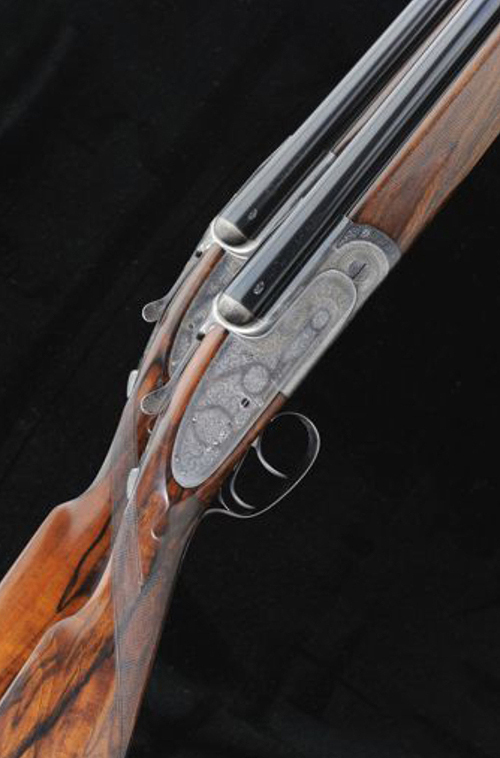 One example by Birmingham’s Westley Richards carries an estimate of £3,000-5,000, while another unsigned example is expected to fetch £2,000-£3,000. Both guns are over 7 foot (More than 2metres) in length. For Further information on the auction and forthcoming valuation days, please visit www.gavingardiner.com or call 01798 875300.